The mere mention of one of my favourite foods was enough to make my ears perk up. Peanut Butter Jelly is a brand new bar and restaurant on Whistler and Sydney Streets in Manly. Given the name there are plenty of peanut butter items on the menu, but mainly dessert based. 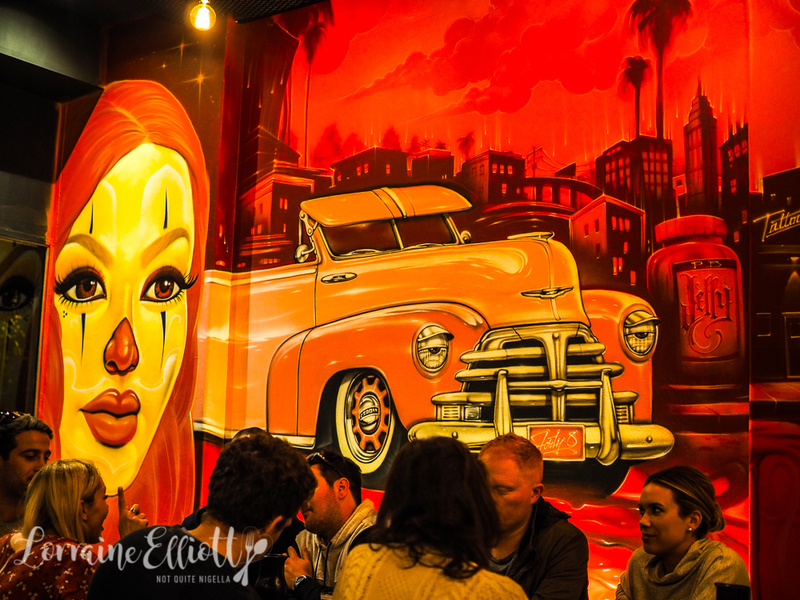 Otherwise there are tacos, baos, burgers and a big side serve of Mexican-American graffiti artist Mister Cartoon or Toons. All night long I've been staring at a spray painted woman spilling out of her bikini. That's apparently artist Toon's ex wife. 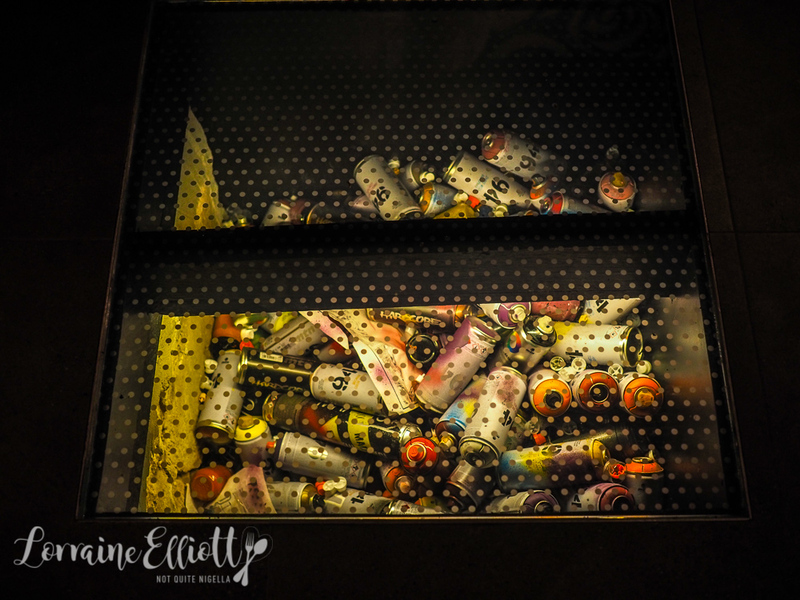 The graffiti artist (known for tattooing celebrities like Eminem, Travis Barker, Slash, Dr. Dre, 50 Cent and Beyoncé) was brought over to Sydney to spend four days spray painting the walls. In total Peanut Butter Jelly used five graffiti artists from Australia and America including Madsteez (NY), Usugrow (TYO), Mayonaize (MEL), Phibs (SYD) and Rone (MEL). We enter through the Whistler street entrance which is the more colourful way to enter past the "Mayo-tunnel" and the Don't Be Jelly neon sign to the main part of the restaurant. The Arabic looking writing on the wall is actually in English - if you look at it at the right angle it says Peanut Butter Jelly and the owner's name in script. 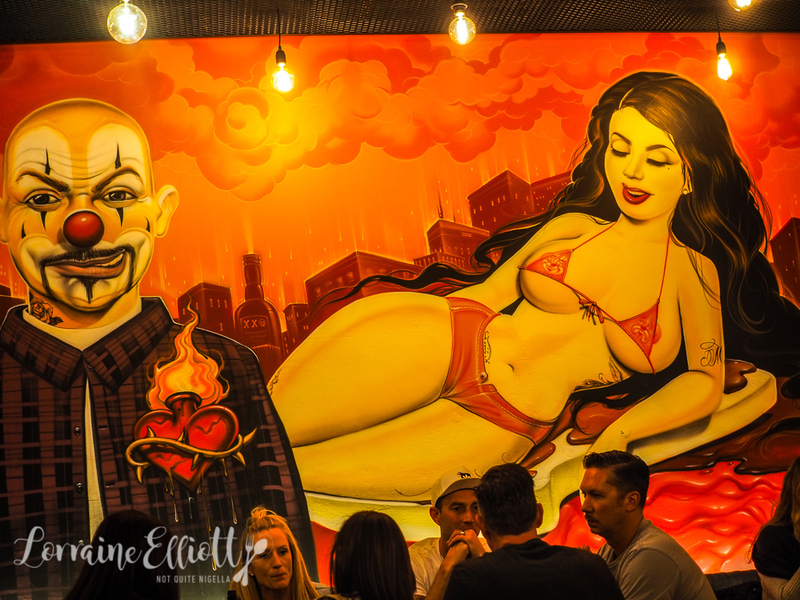 The restaurant is lined with banquettes on both sides and we slide into one where we stare at cartoon clowns to the thumping music. Service is friendly and personable. 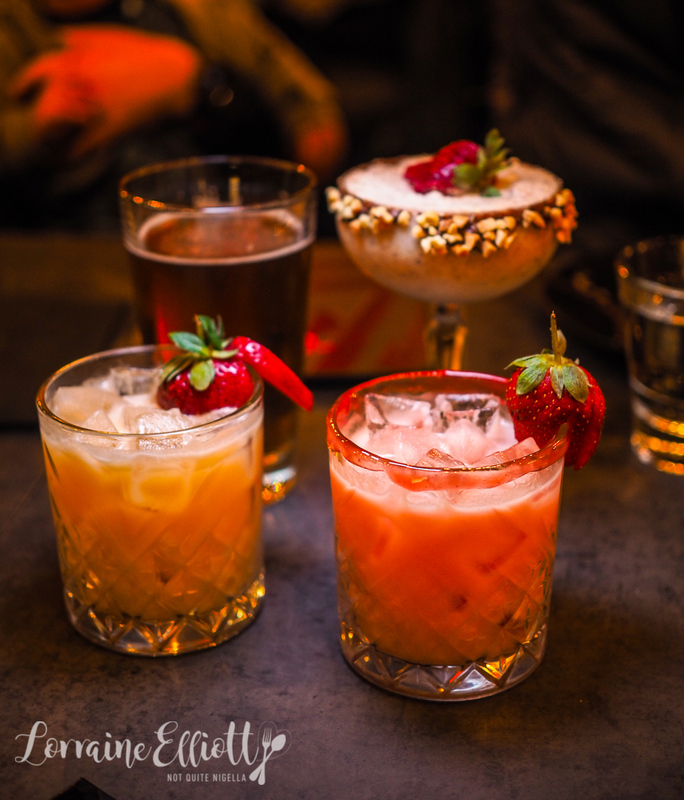 We start with a round of cocktails. Mr NQN's is a peanut butter whisky sour with peanut butter infused Fireball, lemon, sugar and whites. 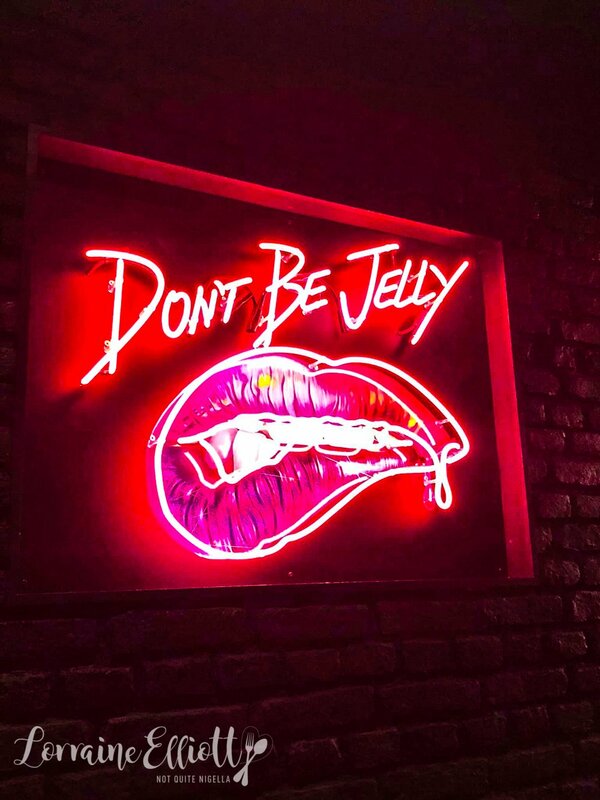 Louise has a Peanut Butter Jelly Jam with peanut butter infused vodka, Chambord, lemon juice, whites and raspberry jam which is a bit unusual. I like my pick (which is really a dessert) aptly called the Peanut Butter Jelly Dessert with vodka, Frangelico, vanilla syrup blended with ice cream, Nutella and smooth peanut butter. Viggo orders a Jelly Belly Lager. We asked for some recommendations from our friendly waiter and went with them. 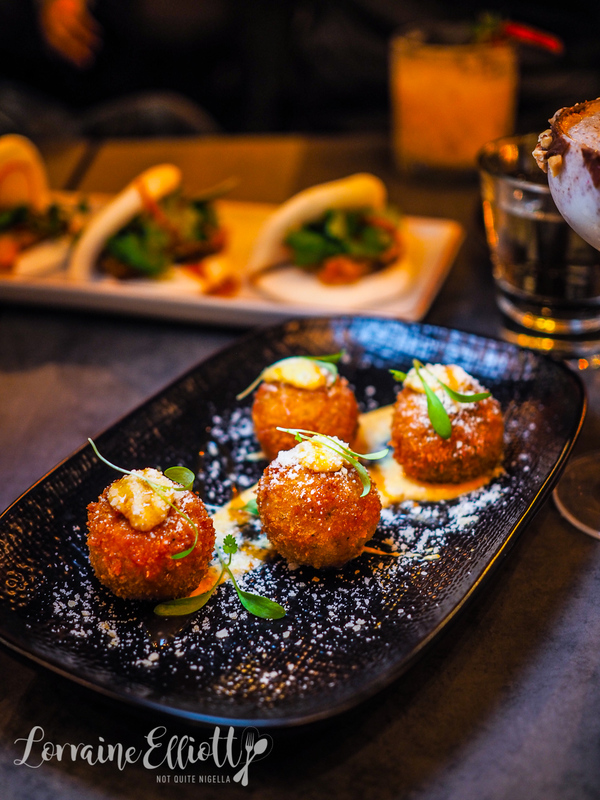 The curry arancini balls are appealingly crunchy on the outside and are served with spiced curry mayonnaise and shaved parmesan. They're slightly sweet and I adore the curry mayonnaise on these. So while most restaurants don't mind upsizing a dish to add another one because there are four dining apparently Peanut Butter Jelly do not do that. 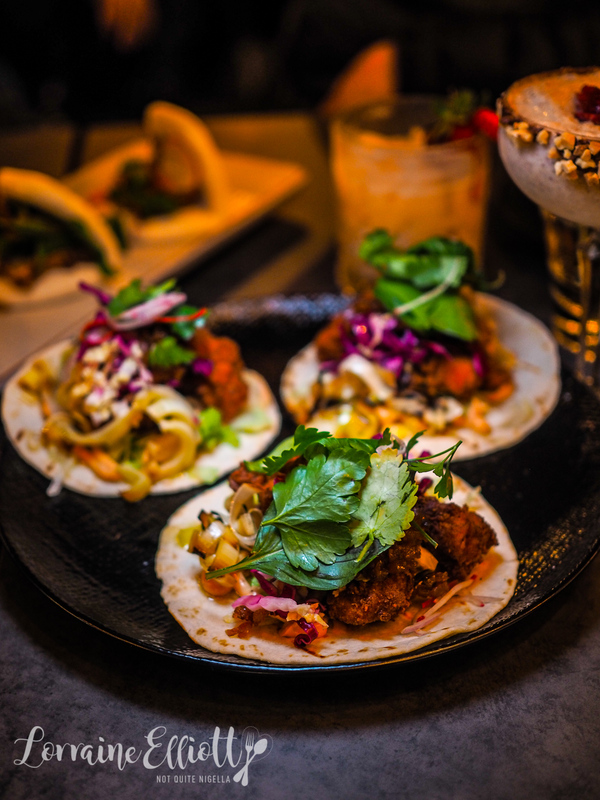 So Louise and I shared a popcorn chicken tortilla with chopped deep fried chicken, charred leek, lettuce and a habanero relish in a toasted flour tortilla. It's quite nice-Mr NQN's favourite dish of the night although I could not really taste any of the habanero relish in this and I would have loved some heat. Again we weren't able to get four of these per serve so we made do with three. 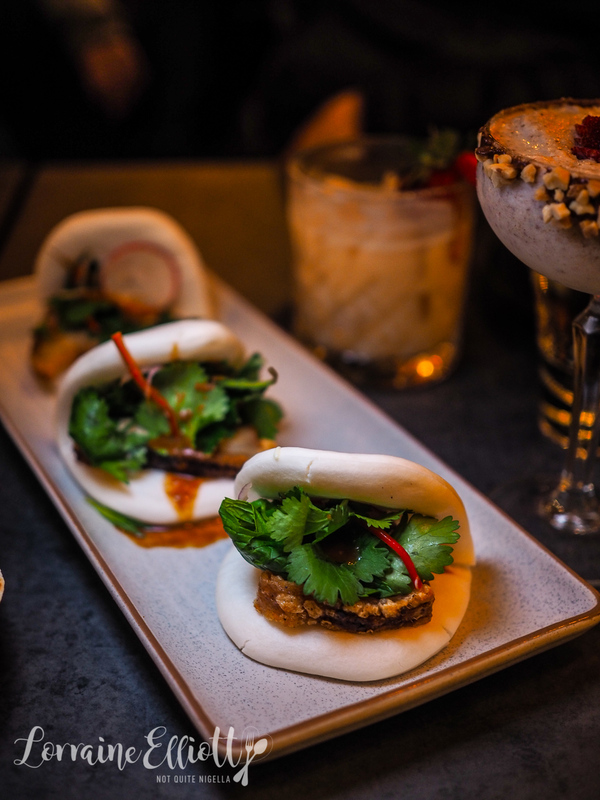 They're soft baos filled with a slice of roasted pork belly, Asian salad, soy garlic and ginger in a bao. By now we've eaten a lot of baos. It's a pleasant enough bao. One of my favourite dishes is this simple but delicious potato dish. 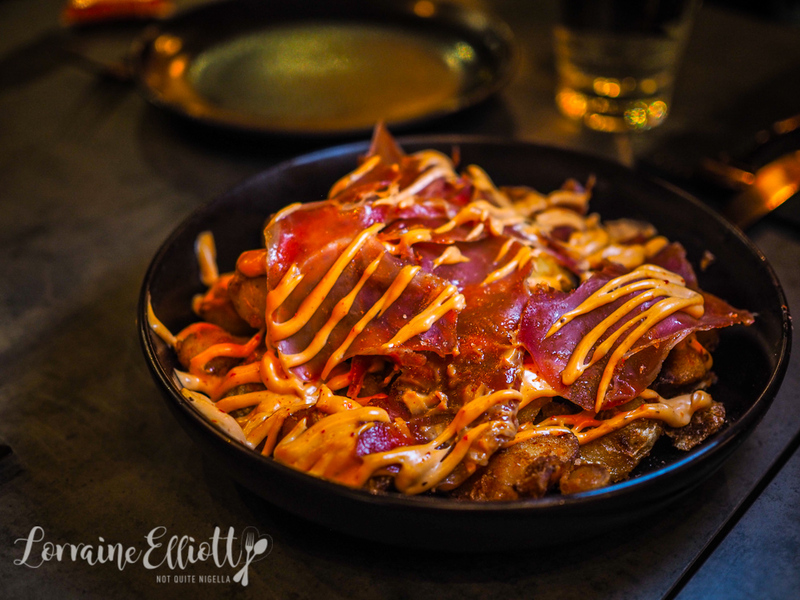 With smashed, fried potatoes, spiced salt, shaved serrano ham and a delicious smoked chipotle cream I kept searching the bowl for the crispy edged small pieces. The charred cauliflower is nice although I like my cauliflower much more charred than this. 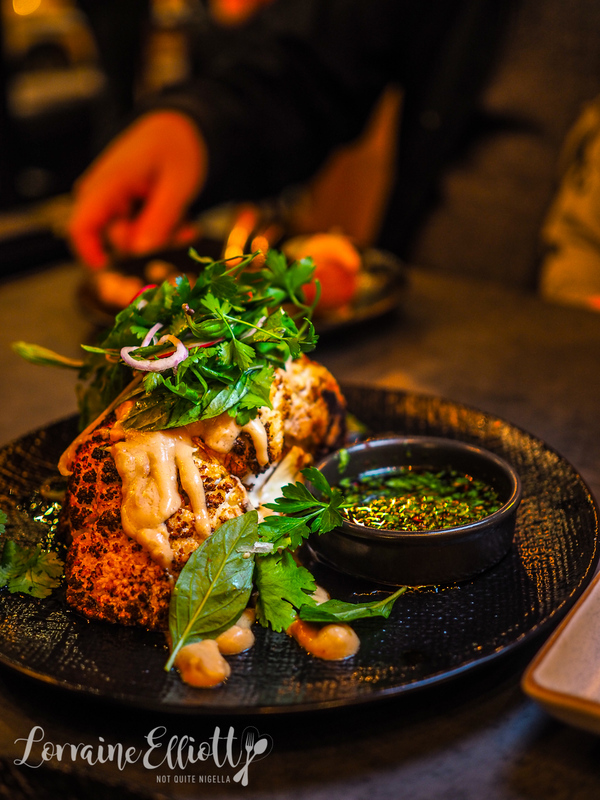 It is served with a cream satay sauce, roasted peanuts, fresh herbs, eschallots and nam jim. 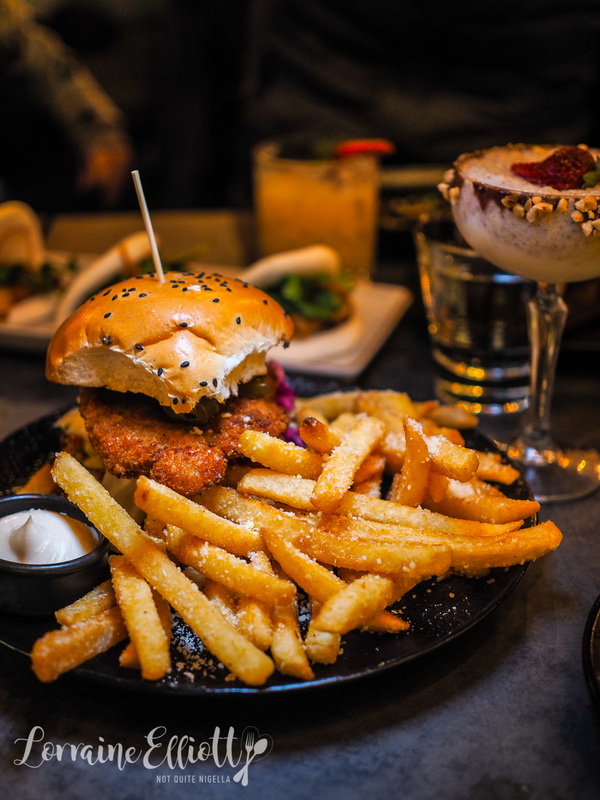 The hot bird burger is a crunchy butter milk fried chicken thigh fillet, Asian slaw, pickled jalapeños and black sesame mayonnaise and big chunks of iceberg which fell out while eating. It was a bit of a dry burger and the fillet was quite a thin uniformly flat one whereas I love a thick, big gnarly edged, juicy chicken fillets. All burgers come with a side of fries and aioli and we upgrade ours to have truffle parmesan on it. There's a bit of a wait for our desserts although our entrees and mains were fast to come out. As expected, the desserts all contain peanut butter and we order three out of the five. The first is a very solid, dense chocolate brownie orb with a creamy chocolate centre. 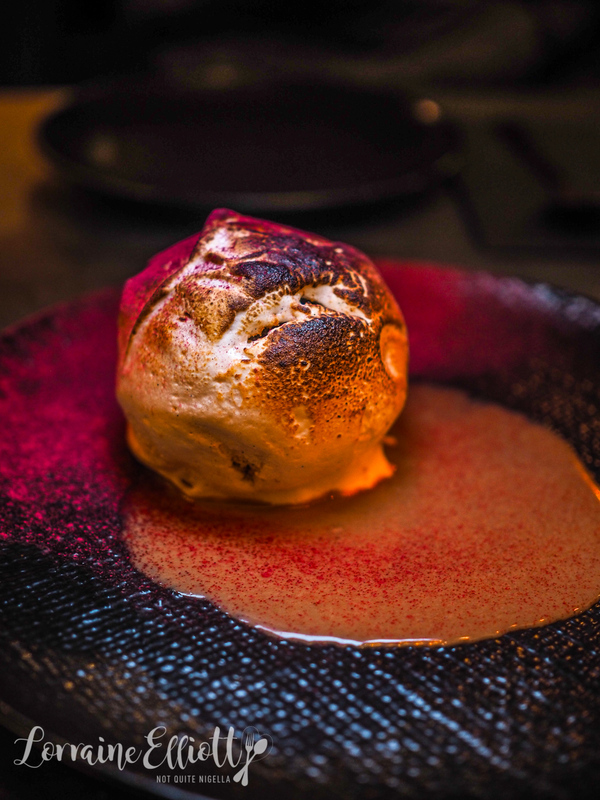 Outside is toasted marshmallow and raspberry powder on top. It's not served warm as it is says it is, it's quite cold and hard which is perhaps why it is a bit hard to eat. The Twinkee is like something from a fair. 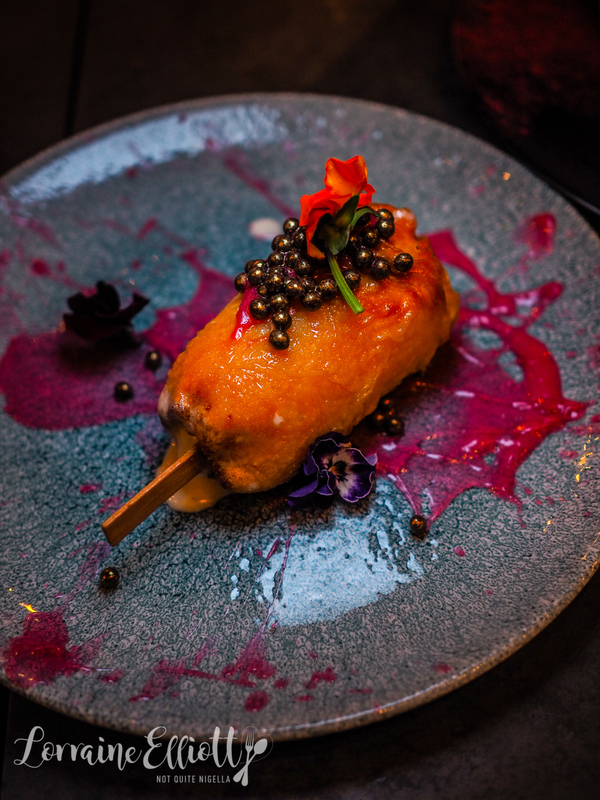 It's a deep fried lime cheesecake ice cream with a crispy batter, a splat of pink sauce and chocolate pearls. The inside is completely liquid once we crack it open whereas if it was a bit more solid it would have been great. 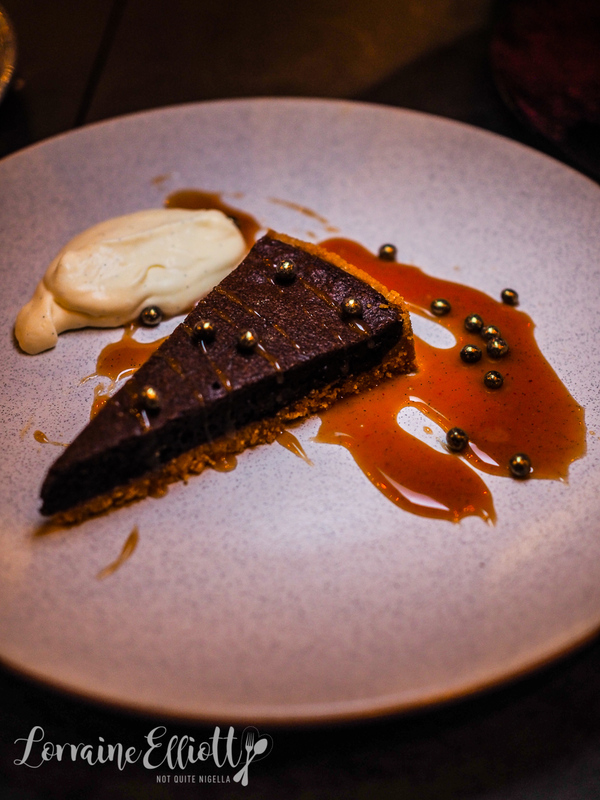 My favourite was the simplicity of the chocolate pie with a very, very mild hit of chilli and served with a caramel sauce and a miso chantilly cream. I liked the crunchy texture of the base and the chocolate and it was hard to stop at one bite. So tell me Dear Reader, do you have a favourite graffiti artist? Are you a peanut butter lover too and if so are you team crunchy or smooth? restaurant The Nightmare Before Christmas-Halloween!